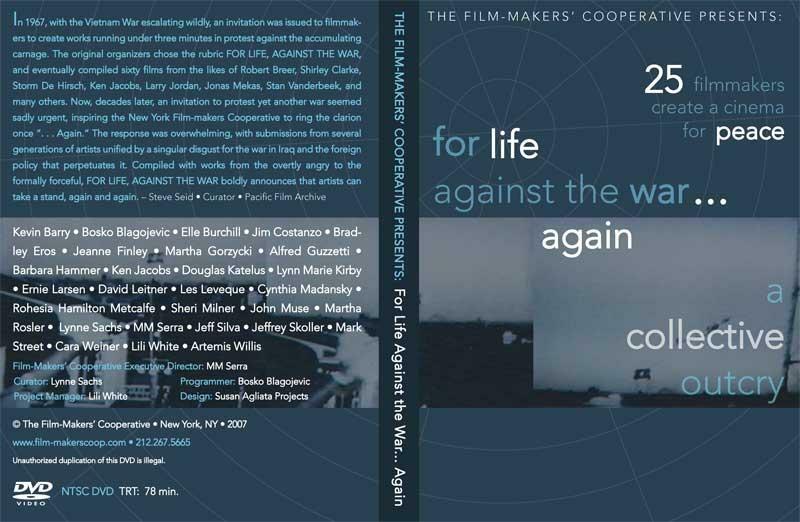 Filmmaker Participants on DVD: Kevin Barry, Bosko Blagojevic, Elle Burchill, Jim Costanzo, Bradley Eros, Jeanne Finley, Martha Gorzycki, Alfred Guzzetti, Barbara Hammer, Ken Jacobs, Douglas Katelus, Lynn Marie Kirby, Ernie Larsen, David Leitner, Les Leveque, Cynthia Madansky, Rohesia Hamilton Metcalfe, Sheri Milner, John Muse, Martha Rosler, Lynne Sachs, MM Serra, Jeff Silva, Jeffrey Skoller, Mark Street, Cara Weiner, Lili White, Artemis Willis. NTSC DVD TRT: 88 min. “Iraq is not Vietnam, as the Bush administration and other Republicans have generously taken pains to remind us over the last half decade, but good luck trying to convince today’s artists of that. Not the kind of artists typically touted at white-shoe galleries, of course, too busy creating precious objects for clueless investors: Far more potent demonstrations of protest and disgust emerge from the rag-tag networks of micro-budgeted experimental filmmakers. With little or no market for experimental filmmaking, the scene consists of only the most devoted individuals, with nothing to lose from saying whatever they wish. The art they create can thereby be rough or polished, face-slappingly blunt or poetically subtle, stridently collectivist or stewed in lonely isolation. For Life Against the War . . . Again, a recent omnibus produced in response to Iraq, includes all these extremes, but nevertheless coalesces into a potent time capsule of how today’s war has churned our inner lives. For Life updates a concept first enacted in 1967, at the height of the previous debacle. 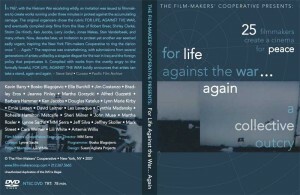 Then, an event called The Week of Angry Art asked 60 filmmakers to make 16mm works of three minutes or less in response to the war in Vietnam; participants included a collection of now-canonical figures such as Jonas Mekas, Robert Breer, and Shirley Clarke, as well as less well-remembered names. Last year, avant-garde film distributor The Film-Maker’s Co-op issued a similar open call for new works about today’s war, resulting in a program of 25 video shorts; both the 1967 and 2007 editions screen at Anthology this week. For Life Against the War Again! Audio diaries of Chaplin Major Eric Olson combine with a single landscape shot. The implications of an Iraqi’s death reveal the complications and tragedy of war.